Have you ever had to add a button hole to an already finished garment? It sounds impossible, but it’s not – as Amy Kaspar explains…. I have had a few requests for a how-to on adding a buttonhole to an already-finished garment. As it happens, I purchased a copy of Elizabeth Zimmerman’s book “Knitting Without Tears” for $.25 at a thrift shop, and for the sake of this tutorial, it was the best quarter I have ever spent! First bit of advice: practise this technique on a gauge swatch before doing it on an actual garment. The procedure involves cutting and unravelling, so you will only get one chance on the knitted item. It is not difficult, but if you do it incorrectly, it will be quite difficult to reattach the yarn and try again. All you need is your smooth swatch, a pair of scissors or clippers, a tapestry needle, scrap yarn, and an optional crochet hook for weaving in the unravelled ends. Ready? Before you take out the scissors, remind yourself that you only get one snip. That said, determine where you want the buttonhole to be located. The beauty of doing the buttonholes last is that you can put them anywhere at all. Snip one strand…just one…at the centerpoint of where you want the buttonhole to be. Next, unravel that strand in both directions, based on how large you want the buttonhole to be. I unraveled three stitches on the top and bottom, so that the snipped strand is not poking out from the loop of a stitch. Use your tapestry needle to just pull out that one loose strand, one half-stitch at a time. Make sure the strand ends up in between stitches. By the way, if you wanted to add a pocket instead of a buttonhole, you can just unravel further and use the live stitches left behind to knit a pocket in the round. When you see the buttonhole is the size you want it, now it is time to sew up those live stitches. Zimmerman recommends the sewn cast-off. I used a slightly different yarn colour for the sewn cast-off, to make it easier to see. To do the cast-off, thread your cast-off yarn into a tapestry needle and insert it through the first two stitches (starting at either the bottom-right or the top-left stitch) purl-wise, from right to left. See the orientation of the stitches? You will be basically sewing the stitches in a clockwise direction. After pulling the yarn through, go back and insert the yarn into the right-hand stitch knit-wise, from left to right. Pull the yarn through. Repeat these steps, beginning with the next stitch to the left of where your yarn is currently residing. Keep sending the tapestry needle through the next two stitches purl-wise, and back through the first one knit-wise, so you are going two steps forward and one step back on each purl-wise/knit-wise cast-off pair. When you get to the stitch at the end of either the top or the bottom row, use the first stitch in the still-knitted fabric as part of the sewn cast-off. If you only use the live stitches, you will end up with a hole on each side of the buttonhole, so it is important to include that stitch one past the last live stitch in the cast-off. When you have gone around the top and bottom, weave in your ends by first going through the first stitch you used for your cast-off, and then weaving through the wrong side of the fabric. If your unraveled ends are not long enough to thread through a tapestry needle, then use a crochet hook to secure those teeny ends. You can also tighten the cast-off one stitch at a time if need be, but you still want it to be a bit flexible so a button can fit through it. Well, look! A buttonhole. If you use this technique with the wrong side facing as you sew instead of the right side, you will have a slightly smoother-looking buttonhole, but you will still see the sewn stitches. This is not as flat as a cast-on/cast-off buttonhole would be. It is also the best way to add a buttonhole absolutely anywhere, if you think of it after the fact. If you unravel one (or whatever) too many stitches, just follow the yarn to sew it back into the stitch. Did I mention to try this on a practice swatch first? Yes. Do that. But make your first Elizabeth Zimmerman Afterthought Buttonhole, and your fear will be gone. Have you ever added a buttonhole after knitting a garment? Tell us all about it in the comments! Last updated: February 3rd, 2015. Just wondering. You say “To do the cast-off, thread your cast-off yarn into a tapestry needle and insert it through the first two stitches (starting at either the bottom-left or the top-right stitch) purl-wise, from right to left.” But to me, it looks like your inserting your needle into the first stitch on the bottom right. Am I missing something? Thanks for the tutorial. Savannagal…Amy here…oops! You are right…I have edited the post to be worded correctly. You are sewing clockwise, so start at either the top left or bottom right. Thank you for pointing that out! Would like to enjoy your patterns and advices but I am still waiting for my order! Thanks for your message! 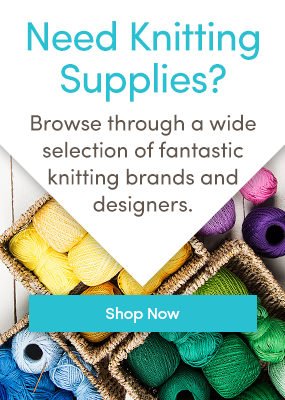 If you would like to find out the status of your order, please email info@loveknitting.com and they will answer as quickly as possible. I need to put an afterthought small single yarn over buttonhole on a garter stitch band on an infants garment. Is there a simpler way to add one?